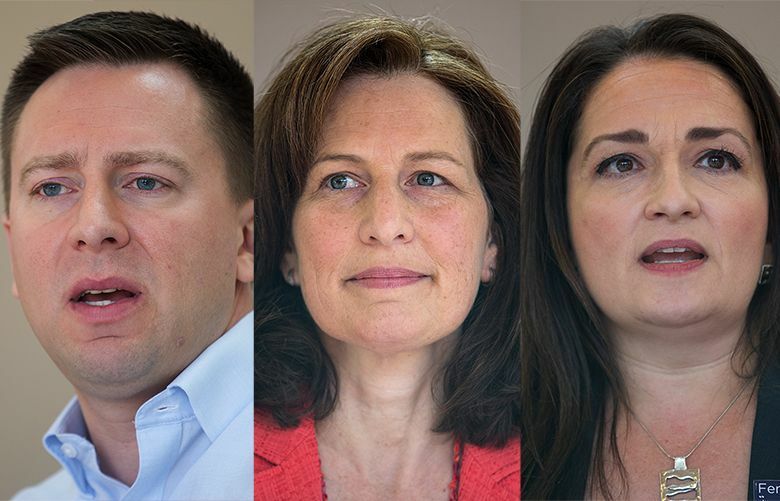 Democratic congressional candidates Kim Schrier, Jason Rittereiser and Shannon Hader have not embraced calls by some in their party to abolish Immigration and Customs Enforcement, better known as ICE. Calls to abolish Immigration and Customs Enforcement, known as ICE, have multiplied among Democrats in reaction to President Donald Trump’s “zero-tolerance” crackdown on illegal immigration. Some potential 2020 Democratic presidential candidates have taken up the cause, including New York Sen. Kirsten Gillibrand and Massachusetts Sen. Elizabeth Warren. Democratic socialist Alexandria Ocasio-Cortez made abolishing ICE central to her upset primary win over Democratic Rep. Joe Crowley in New York last week. In Washington, U.S. Reps. Adam Smith, D-Bellevue, and Pramila Jayapal, D-Seattle, are working on legislation that would eventually shutter ICE after working out how to fold its functions into other agencies. ICE was created in 2003 as part of a federal government reorganization following the Sept. 11, 2001 terrorist attacks. While the Border Patrol polices the U.S. border, ICE detains and deports unauthorized immigrants already inside the country. The three leading Democratic candidates vying to succeed retiring U.S. Rep. Dave Reichert, R-Auburn, have avoided joining the “Abolish ICE” cause so far in the 8th Congressional District race. They are competing to get past the Aug. 7 primary to face Republican Dino Rossi, the former state senator and three-time statewide candidate. While critical of ICE and Trump’s immigration policy, especially the separation of asylum-seeking parents from their children, the Democrats — Kim Schrier, Shannon Hader and Jason Rittereiser — did not join calls to eliminate the agency in statements this week to The Seattle Times. “I agree with the Congressional Hispanic Caucus that abolishing ICE won’t solve the problem of cruel and inhumane enforcement by the Trump administration,” said Schrier, the Issaquah pediatrician who has led Democratic contenders in fundraising. Hader, a former division director at the Centers for Disease Control and Prevention, who returned to her hometown of Auburn to run for Congress, said ICE is on “the wrong track, with the wrong focus,” but said she’s not sure it should be done away with. “We need a change of culture and priority focus from our immigration officials. We need to make sure they are provided with the tools and training to ensure robust border protection that is also nondiscriminatory and humane. We need to make sure we fully staff the experts who are needed to review immigration and asylum applications in a thorough and timely way. Does this mean abolishing ICE? Maybe, maybe not,” Hader said. “Changing the ‘form’ — the name or which agency is responsible for immigration and naturalization frankly does not automatically address ‘function.’ We need to change expectations, authorities, and practices of our immigration and border mission to align with American values. And Congress needs to provide the oversight to drive those changes,” she said. Rittereiser, an attorney and former King County deputy prosecutor with Ellensburg roots, didn’t directly address ICE in his statement, but said the focus should be on broader policy. “The problem in our immigration policy is Congress’ failure to pass comprehensive immigration reform and an administration that is dictating immoral and unlawful immigration policies. I oppose the way immigrants are being treated at our southern border, which is why I’ve launched a nationwide pro bono legal effort to represent immigration officials who oppose the immoral immigration and unlawful policies being ordered by the Trump administration,” Rittereiser said. Taking a centrist approach is likely warranted in the moderate 8th District, which spans the Cascade mountains, including parts of East King and Pierce counties and all of Chelan and Kittitas counties. While the 8th tends to support Democrats for president, including Hillary Clinton narrowly in 2016, it has never elected a Democrat to Congress.